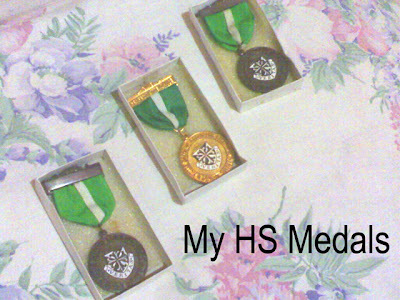 I have forgotten that I have this medals during my highschool days. Few days I was cleaning my drawer and whala.... I found something important for me. It was such a good years for me, because inspite of minor sickness I still wanted to go to school. And with that, I have a GOLD MEDAL, for PERFECT ATTENDANCE.... yes... from 1st year to 4th year in High School, I haven't missed any of my class. Except only official business...I was really participative during high school. What is.... I do have lots of confidence because I'm with all girls. No boys to get conscious with, and to bug me into somethings. I do admit that I was a 'tomboy' that time, I just don't like to be fully feminine and girlash like what others do. But I had so much fun way back HS. I have bronze medal for "DRUMS CORPS", bronze medal for "ATHELETIC", and a GOLD MEDAL FOR PERFECT ATTENDANCE. The moment I saw this, flash back my high school days. hey i got the same stuff you got! gold medal for perfect attendance, bronze for that drums thingy, certificate or medal for a cathecist, i also got medals from girlscout!hahaha omg! i miss my medals, i'll definitely take it here when i go home... oh yah, its always SALAS, SALAZAR in the attendance! sweet! bestfriends forever right?love you! hahaha but hey! i never missed a class, i even had pneumonia and my dad was getting really mad at me but i still didnt miss any class... i realize afterwards that i could have died w/ pneumonia and still attending class... although, i often sleep in our class but still we didnt miss a single day from it right?? ?